Testosterone Injections Side Effects! Inject Testosterone! Testosterone injections cause a rapid increase in hormone levels which can lead to a roller coaster effect. What happens is, testosterone levels rapidly increase in the beginning stages, but then bottom out in the days leading up to the next dose. T levels will usually dip well below normal at the end of a cycle, which is not a pleasant experience. The most common forms of injectable T are cypionate and enanthate. Both aromatize very easily which means that the conversion rate to estrogen is relatively high. Big doses of cypionate or enanthate equal big jumps in circulating estrogen which is not a good thing. T esters are typically suspended in either cottonseed oil or sesame seed oil. Some men will have an allergic reaction to one of the oils once they are injected. Keep in mind, these injections can often be very painful. Users regularly report pain, swelling, itching, and rash near the injection site. They are typically administered at intervals of 2 to 4 weeks into the buttocks. This sends the T directly into the blood stream which avoids metabolism by the liver. Hormone replacement therapy should be your last resort after all other options have failed. T injections will shut down your body's natural production of testosterone. It will also cause testicular atrophy and other side effects. 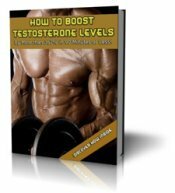 Follow the advise on this site and use natural testosterone boosters , and other non medical methods first. From most men, this will do the trick! If you are one of the unlucky few, then go ahead and look into testosterone replacement therapy, as the benefits will probably outweigh the side effects in your situation.